I am absolutely facinated by snowflakes. I have never actually seen them and it doesn't matter if I travel to Mount Everest, I know on the day I arrive it would be a lovely sunny day with snow everywhere. So this is probably the closest I will come to seeing a snowflake with it's lovely crystalline shape. 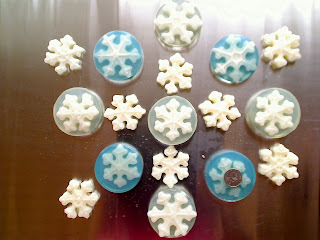 I have kept all the snowflake white but I like the transparent blue which gives a cool feel to the snowflakes. I have also added cosmetic glitter to make it more festive.